The mission of this blog (and for that matter, my life’s work) is to help people life happier, healthier, more mindful and creative lives. With that intent, I offer movement experiences, writing, and art that are fun and interesting and entertaining and also expand your practice, awareness and vision of yourself and what is possible. 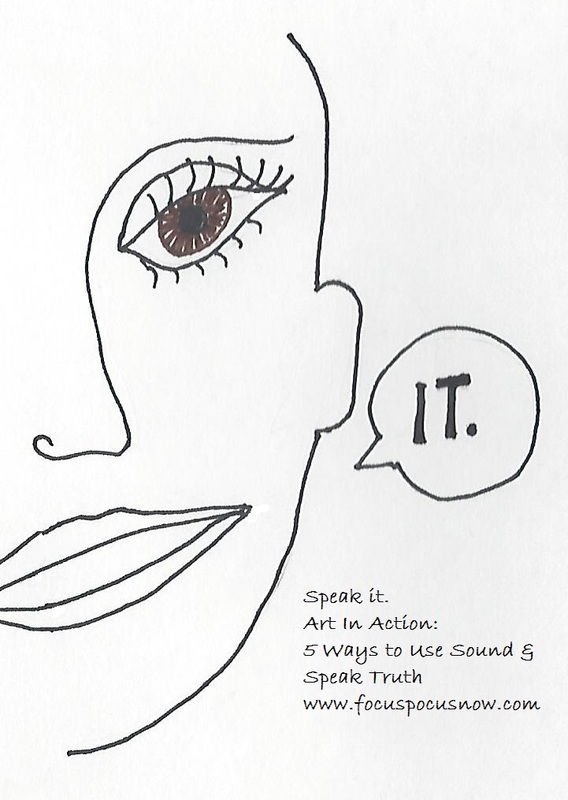 Art in Action is a new weekly post: a short, practical guide to applying the ideas and principles in the Focus Pocus posts to your body and life. As always, I love to hear from you about how you use them and how you translate the ideas into action. There are benefits for body, mind, emotions and spirit to using sound, but it can be challenging to find ways to begin to integrate sound and breath and satya (truth in Sanskrit) into an average day. Here are five simple ways to make more sound and speak more truth. 1. Use audible breath while meditating. If you sit to meditate and your mind is bouncing around like a drunken monkey, gently make an audible breath (imagine fogging a mirror then do that with your lips sealed). The sound of your breath will quiet your monkey mind and give you a focus for your attention. If you’ve never meditated, begin by simply taking 10 mindful (and audible) breaths and build from there. 2. Sing. Sing to yourself in the car, the shower, while cooking! Sing along to the radio or be your own iPod. Open your mouth and let it out. Just like dancing, it’s not about your song being “good,” it’s about the healing feeling of singing. BONUS: Sing a song that is particularly inspiring to you and really let it rip. 3. Say your preference. If someone asks what you’d like to do, say your preference. Even if you are on the fence and don’t care that much, pick your preference and say it. 4. Say a kind thought out loud. If you think a generous thought about someone, even a stranger, say it to them. Tell them they look great or that their work makes a difference to you or that you admire their courage. BONUS: Say it to them in person, out loud with witnesses. 5. Notice a tight throat. Pay attention to the sensation in your throat, particularly in emotional or challenging situations. A tight, constricted feeling in your throat is a sure sign that you have something to say. Throat awareness can help you sort it out and say what needs saying in an authentic way. BONUS: What’s the truth that needs saying in your life? Is there someone who you’ve held the truth from? Have you been stingy with encouragement or have you swallowed bullying behavior? Have you said I love you to everyone who you love? Speak your truth, your satya.